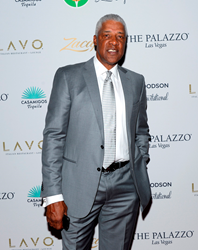 “I am excited and humbled by this opportunity to host my own Golf Classic at Aronimink Golf Club,” said Erving. On September 12-14, celebrities, golfers and athletes will travel to Philadelphia for the Julius Erving Golf Classic, held at the famed Aronimink Golf Club in Newtown Square. The event, hosted by basketball Hall of Famer, Julius Erving, affectionately known as Dr. J, will include a basketball clinic, a celebrity golf tournament, VIP Gala and Red Carpet Pairings Party all in support of The Salvation Army, an organization dedicated to providing humanitarian aid to those in need. The three-day event will kick off on Sunday, September 12 with a youth basketball clinic in partnership with the Salvation Army, that will host junior participants for a fun, hands-on clinic with Erving. On Sunday, September 13, Erving will host the Black Tie Ball, Red Carpet & Pairings Party, where guests will meet and mingle with signature cocktails presented by CASAMIGOS Tequila. The following day, guests will head to Aronimink Golf Club to tee-it-up at the Erving Golf Classic tournament. The course will be set-up as a Julius Erving museum, where each hole will display signature moments in time throughout Julius’ iconic career in basketball. During the golf tournament, the ladies will enjoy a Champagne and Caviar in the famed Aronimink Clubhouse with Dorys Erving, wife of Julius Erving. Aronimink Golf Club’s Donald Ross-designed course has a rich history in golf, and is consistently rated one of the finest and most challenging in the US. The course has played host to the PGA Championship, the Senior PGA Championship , the AT&T National, hosted by Tiger Woods, and the U.S. Amateur and will also host the 2018 BMW Championship, an official stop on the PGA TOUR. Tweet us. Like us. Visit us.